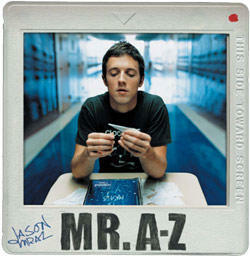 Has anyone checked out Jason Mraz?? weird last name I know, but the guy's a lyrical genius. Kind of like a wittier, funnier John Mayer. Now don't get me wrong... I LOVE John Mayer and I do believe it is ok for me to love MR. A-Z as well. That's the psuedonym he goes by now apparently. Psuedonym is a strange word to type... I am queen spelling bee and I had to spell-check it.... it also makes me think of that song psue psue psuedia.... you know the one by phil collins...? But that's besides the point. What I'm trying to say is you should definately check out Jason Mrazs' stuff (legally or illegally, whatever.) Seriously, the guy is good..pensive, introspective, refreshingly original. I've been a Mraz fan since I heard that song ' The Remedy', but listening to the songs was really the extent of my fan-dom. Today, however, I discovered a new aspect to his genius. He's a blogger!! well, I guess technically it's called a "digital journal", but it serves the same purpose. Basically, he just floats up whatever wonderful thoughts and descriptions going through his head at any particular moment. Very entertaining stuff... Anyway, don't take my word for it. I've posted a link below where you can find a sample of his entries. Check it out, it won't kill you! Smoke it like it's hot, P.I.M.P.s! !